The Green Mountain trail is located in the Grand Mesa National Forest near Grand Junction, Colorado. The trail stretches for 6 miles between the Hay Park Road, FR #129, and the Surface Creek Road, FR #125. There is another section of the Green Mountain trail that begins at the Surface Creek Road and ends near Bailey Reservoir. Some maps show the section between the Hay Park Road and the Surface Creek Road as the West Green Mountain trail but they also show a slightly different route from the one the trail actually follows. 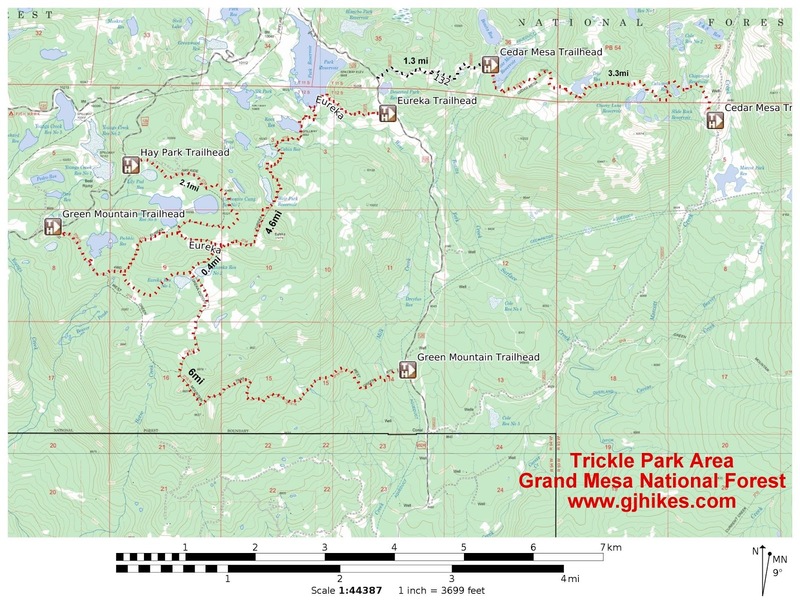 To get to the trailhead follow the Trickle Park Road, FR #121 from the Grand Mesa Visitor Center on Highway 95 for 6.2 miles and turn right on the Hay Park Road, FR #129. Continue on FR #129 for about 2 miles where there is parking on the right hand side of the road at Ryan Lake. The Green Mountain trail begins on the opposite side of the road from the parking area. The trail starts out along an old road that has a slight uphill grade. The road eventually turns into a double track after a mile or two. This end of the trail travels mostly through tall stands of pine and spruce trees. Near the half mile point the trail passes by the picturesque Prebble Reservoir. Anyone that is looking for a nice short hike to do might find Prebble Reservoir to be a good destination. Dusky grouse can be seen at times like this female that hopped fearlessly on top of a log as we passed by while most of her chicks paid little heed to our intrusion other than one which imitated its mother by also climbing onto the log. Around the 1 mile point the Green Mountain trail is met by the Eureka trail and near the 2 mile point it is met by the Eureka Cutoff trail. From there the trail passes between Eureka Reservoir #2, on the left, and Eureka Reservoir #1, on the right. After passing the Eureka reservoirs the trail comes out on a meadowy mesa where the land seems to end and distant scenes of the San Juan Mountains and the Elk Range can be seen. At the edge of the mesa the side of the mountain comes back into view as the trail steps its way down to another series of meadows. On this day a few elk could be seen crossing the trail up ahead. A little past the halfway mark at the 3.3 mile point from the Hay Park Road the trail passes a closed route that heads west toward Horse Creek that doesn't show up on any maps. From there the trail turns more toward the east and begins a descent that is steep at first down a slope of loose rocks and dirt. On the return trip we counted the steps, which is something we do at times on steep sections of trail, and came up with less than 300 before it began leveling off again. It's a head game that we play that seems to help keep spirits up and keep fun from turning into work. After all, 300 hundred steps is practically nothing. The trail quickly levels off as it continues amidst the peaceful forest of aspens where through the trees an occasional deer can be spotted. The mild temperature at this altitude coupled with the aroma of the forest make the experience very pleasant. A glance at the elevation profile of the Green Mountain trail shows the little bit of uphill that it starts out with followed by the mostly gradual long descent that takes it down to the Surface Creek Road. Near the end the trail crosses Milk Creek which is followed by a short climb that takes it to a large parking area just before reaching the Surface Creek Road. As can be seen there is ample room here for vehicles with ATV and horse trailers to park. The return trip is mostly uphill but for anyone that is Colorado fit it's not all that bad. Mountain bikers should have little trouble other than the short climb out of Milk Creek near the east end of the trail and the short section of loose rocks and dirt. A person could also start at the Surface Creek trailhead and save the downhill for the return trip. Most of the people on the trail are riding ATVs so it probably doesn't matter much to them which way they go. 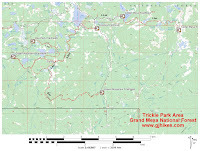 There are several options for backpackers and for combining different trails for loops that are in the 10-20 mile range. However you go about it the Green Mountain trail is a great option for a summer outing in the Grand Mesa National Forest. If you would like to see it for yourself then all you have to do is 'Take a hike'.